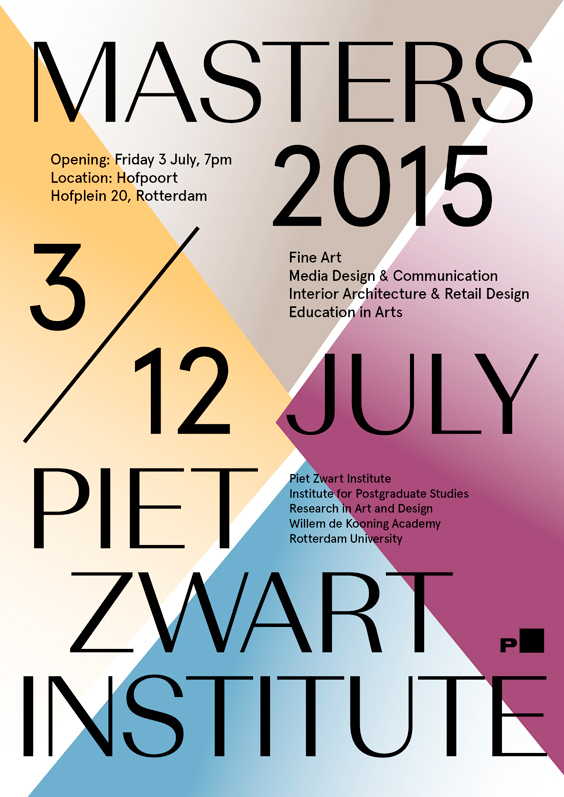 The Piet Zwart Institute hereby cordially invites you to the OPENING of MASTERS 2015, our departments’ graduation exhibition and events, July 3rd, 7pm, at the Hofpoort Rotterdam. The exhibition is up through July 12, and open daily 11am-5pm. Please scroll down for an overview of our SPECIAL EVENTS. 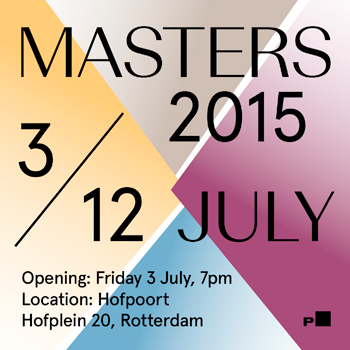 MASTERS 2015 is made possible by the generous support of TENT. In addition to our master students’ work, we encourage you to visit the graduation evforents from Willem de Kooning Academy (Hofpoort, 8-12 July), and the Asscociate Degree; Arts & Crafts. Join us for an evening of media cabaret at V2! This is the official preview party for “Tempted By Tomorrow”, the Master Media Design and Communication graduation exhibition of the Piet Zwart Institute. The evening will be filled with performances, presentations and the opportunity to view installations and discuss the projects that have been produced. The evening is a chance to learn more about the PZI MMDC students’ current work, have a drink, and decide on who should be the winner of ‘Thesis – Karaoke’, the ultimate research based pop-jukebox. In the graduation exhibition Tempted by Tomorrow a broad scope of artists and researchers are presenting the accumulation of their practice based research completed during the past two years of the MA Media Design and Communication program at Piet Zwart Institute. The diverse range of works exhibited demonstrate a critical engagement with the contemporary media landscape. Consdering media history and the changing role of tools and technology in society the work employs different media to reflect critically on different subjects. The works oscillate between elements of physicality, portraying, representation, identification, communication, social engineering and more pertinent questions on the contemporary media landscape. Artists: Mihail Bakalov (BG), ehCaetano (BR/NL), Junyu Chen (CN), Ana Luísa Moura (PT), Henk-Jelle de Groot (NL), Lucia Dossin (BR & NL), Max Dovey (UK), Elleke Hageman (NL), Joseph Knierzinger (AT), Artyom Kocharyan (AM/NL), Lídia Rodrigues (PT), Mathijs van Oosterhoudt (NL) & Nikolaos Vogiatzis (EL). Welcome by HIGH-RISE curator Maaike Gouwenberg and MFA course director Vivian Sky Rehberg. Champagne service provided by Susanna Browne in conjunction with her work I Dream of a Wedding. Three actions take place within Vasiliki Sifostratoudaki’s The Fold of the Cube. For the first action, please find Vasiliki Sifostratoudaki during the opening to hear the story, or to read it yourself. For the second, please return on July 9. For the third, please return on July 12. Publication release HIGH-RISE, edited by Maaike Gouwenberg, with contributions by Alberto Toscano, Sriwhana Spong, Susan Gibb, Michael FitzGerald, Jan Verwoert, Alice Mendelowitz, Francois Steenhuis, Jenn Jackson, Susanna Browne, Sabrina Tarasoff, Claire Biddles, Liz Howard, Philemon Tilianakis, Vincent Rietveld, Jennifer Teets, Hunter Longe, Maaike Gouwenberg. 11:00 Three actions take place within Vasiliki Sifostratoudaki’s The Fold of the Cube. For this one, the second, by reflection a portrait is made in which the background and the theme are merged into one picture. Materials: Water. 15:00 ‘November Complex, Super in Position’ is an event exhibition and performance to be viewed from the 18th floor of the Hofpoort Building, organized by Ghislain Amar, Sighle Bhreathnach-Cashell, and Hunter Longe, guided by Sol Archer. As part of Masters 2015, the Master Education in Arts presents two events which conclude our current lecture and seminar series at TENT entitled Cartographies of Acting Pedagogically: Working with Liquid Logic. The series was developed by Prof. Dr. Frans-Willem Korsten, course tutor of the Seminar Critical Pedagogy, in collaboration with Priscila Fernandes. Public class in which ‘the practice of mapping and unraveling pedagogical structures’ will be tested together with the students and participants. During the previous seminars that took place at TENT, the students explored the potential of a ‘cartographies of acting pedagogically’. They actively mapped their own force field, ranging from the artistic, economic, cultural and technological context, to their professional environment and individual commitment, choices and actions. In different circumstances, a different “where are we?” is at stake, and as such we need a different logic of dealing with issues of autonomy as well. As a closure of the lecture series Cartographies of Acting Pedagogically, a public discussion is organized focusing on Art and Design Education in Times of Change. – Prof. Dr. Annette Jael Lehmann: Black Mountain Research: Raw and Ongoing. Reflection on the art university Black Mountain College (1933-1957) as fuel for a critical debate about models of creativity and collaboration in education today. Journey across the pedagogy of the Liberal Arts & Sciences, in relation to the possible foundations for a new art and design curriculum. The graduation projects this year investigate fundamental rubrics of interior architecture as a discipline in its own right; they entice us to look at the construction and representation of space through a different lens. They question: what is it, actually, that I perceive when I enter a space? When all my senses tell me things that the space itself does not seem to contain, but conjures up in a way that escapes me, then I ask what is this space constructed from? Perhaps things, memories, narratives, serendipitous incidents, technologies, relationships, and presences? It is all of that.